PeakTrace is a Sanger DNA sequencing basecaller and trace processor that provides better basecalling and improves the appearance and read length of DNA sequencing traces by up to 50%. The PeakTrace Basecaller works with all ABI sequencers including the ABI 377, ABI 310, ABI 3700, ABI 3730, ABI 3730xl, ABI 3100, ABI 3500, and ABI 3130. Figure 1. Comparison of the KB and PeakTrace (PT) basecaller. This example shows the same trace file, but processed with the different KB and PeakTrace basecallers. The improvement in sequence quality provided by PeakTrace is real, as shown in Figures 2 and 3. 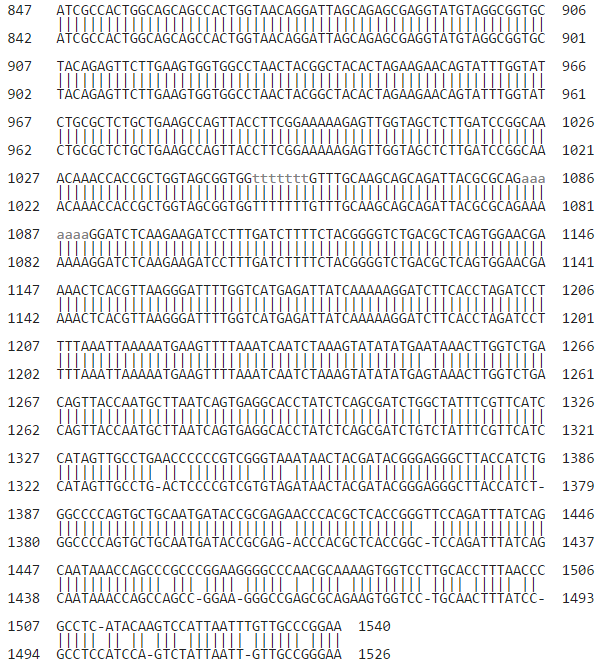 These figures show the alignment of the DNA sequence data from the Figure 1 trace file BLAST aligned to the true sequence. 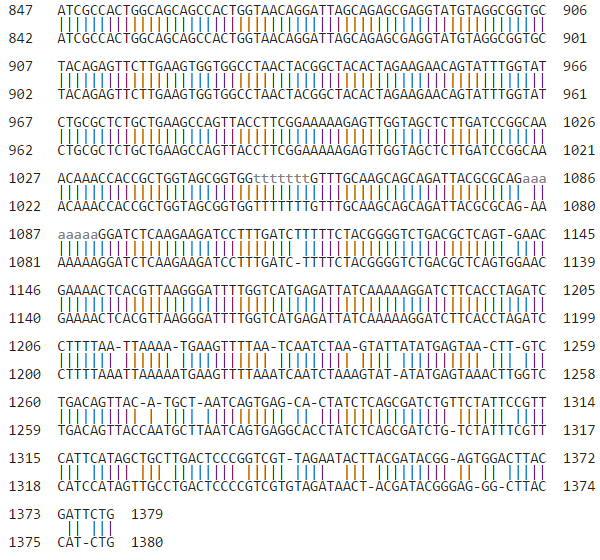 The alignable sequence is not only much longer after using PeakTrace (1540 bases aligned) than KB (1379 bases aligned), but the first error is at nucleotide 1084 with the KB Basecaller and at nucleotide 1251 with the PeakTrace Basecaller. Figure 2. BLAST alignment of KB basecalled sequence against the true sequence. The 1% error read length is 1275 bases. Figure 3. BLAST alignment of the PeakTrace basecalled sequence against the true sequence. The 1% error read length is 1486 bases. How is PeakTrace different from other basecallers like ABI’s KB Basecaller or phred? The simple answer is PeakTrace is just a better basecaller than KB in exactly the same way that KB is a better basecaller than phred or the old ABI Basecaller. KB was a breakthrough in DNA basecalling when released more than 14 years ago and PeakTrace is just a further improvement in basecalling technology. PeakTrace provides longer reads, more high quality bases, and better looking traces than KB or any other DNA basecaller on the market. Why should I use PeakTrace? The improved quality and longer read lengths provided by PeakTrace increases end user satisfaction. Users of PeakTrace have happier customers who send them more samples. Given most of the costs of running a Sanger DNA sequencing service are fixed, it only takes a small increase in volume to make a big difference to your bottom line. Sanger DNA sequencing is not going away any time soon. Despite all the interest and investment in next generation sequencing, Sanger sequencing appears to be here to stay. If you are doing Sanger sequencing, you should be using the best tools available and PeakTrace is the best basecaller on the market. Your competitors are already using PeakTrace (in secret) to gain a massive advantage over you in the market place. The Sanger DNA sequencing market is hyper competitive and you can’t afford to let others offer a better product. If you do, your customers will leave. You only pay for success. Unlike everything else in the DNA sequencing process, you only pay for those traces that are improved by PeakTrace. ThermoFisher won’t give you a refund on the BigDye™ or polymer if the sequencing reaction fails. Because of this, the actual cost of using PeakTrace is a couple of cents per trace when used at volume. PeakTrace can rescue some low quality trace data. This means you can avoid the cost and time of re-running some low quality traces. 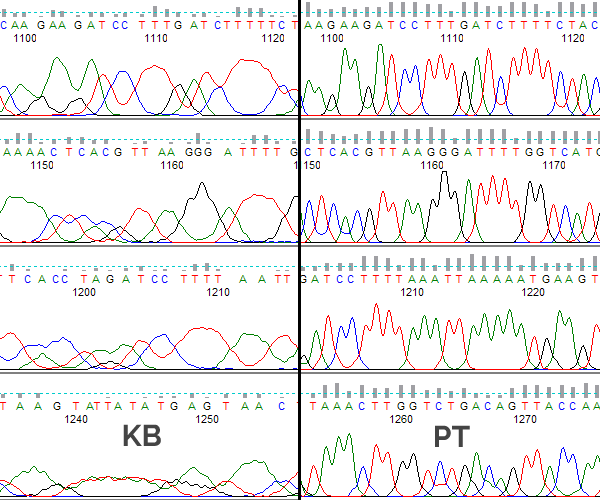 PeakTrace can be used to improve the throughput of each DNA sequencing instrument. PeakTrace can be used in an alternative way to increase the throughput on the machine up to 300%. If you are running short reads and just want to sequence a greater number of samples then peaktrace can be used to push 3x the number of samples per day. If you have multiple sequencing machines you can sell some off and still maintain the same capacity – this can bring in $100,000s. Can I trust the sequence data from PeakTrace? Nucleics has extensively validated PeakTrace to ensure that the basecall quality assignment is accurate. Validating a basecaller on your own is not simple or easy, but if you trust the KB Basecaller, then you can trust the PeakTrace Basecaller too. How can I use PeakTrace? There are four ways to use PeakTrace. The easiest is to just use the online version of PeakTrace, PeakTrace Pro. You will need to register, but you will have access to the full PeakTrace Basecaller with all settings for a week. You can process up to 250 traces per day allowing you to see what PeakTrace can do on a wide set of your data and/or test all the PeakTrace settings. The second way is to use Chromas 2.65 (or higher). The version of the free Chromas trace viewer incorporates the ability to use the PeakTrace Basecaller via the “enhance” function. First time users of Chromas receive 40 free PeakTrace processing units once registered, and additional units can be purchased as needed from our online store. If you need to basecall more traces, the third way is to use the Auto PeakTrace RP software. After registering, you need to purchase some PeakTrace basecalling units from our online store (you can pay by either credit card or Paypal). Once you have purchased a number of units, you will then be provided with the password to download the Auto PeakTrace RP software from the PeakTrace RP Downloads page. 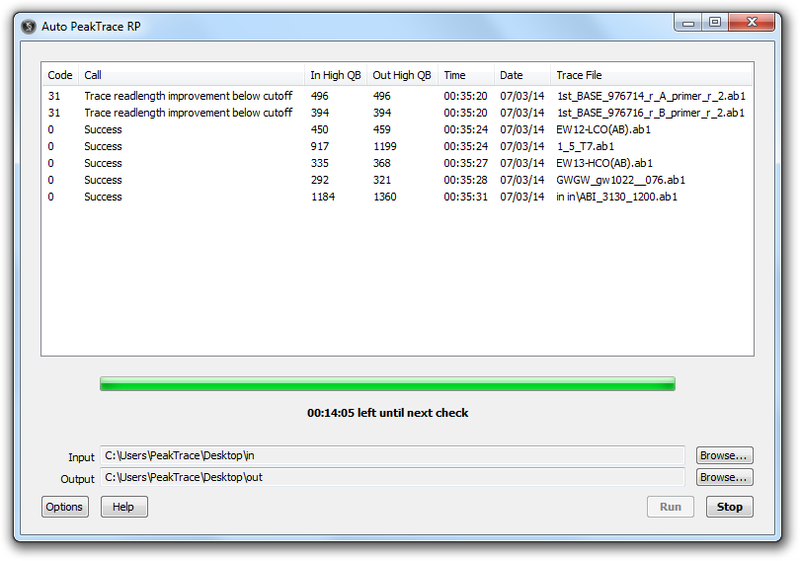 Auto PeakTrace RP is available for Windows (XP to Win10) or MacOS X (10.6 to 10.12). The final way is to use PeakTrace via our standalone PeakTrace:Box System. This is a complete hardware/software system that you can install at your facility and run PeakTrace locally without the need to upload your traces to our server. The PeakTrace:Box system is ideal for users who need to basecall a very large number of traces, or for customers with strict privacy needs. For more information on the PeakTrace:Box system, please visit the PeakTrace:Box overview page. To visually compare the read length improvements offered by PeakTrace, we recommend you use a trace viewing application like ABI Sequencing Analysis, FinchTV or Chromas. How much does Auto PeakTrace RP cost? The Auto PeakTrace RP software is free, but to use it you must register to obtain a copy of the software. Once registered, you will need to purchase some processing units from our online store, or establish a standing account with us. Auto PeakTrace RP provides full user control over all the trace processing and basecalling parameters. These units can also be used with the Chromas version of PeakTrace. The current prices of basecalling traces via Auto PeakTrace RP. How much does the PeakTrace:Box system cost? The PeakTrace:Box system is priced on your actual production volume with a sliding discount for large volumes and longer lease periods. While the exact cost per trace will depend on your volume, lease period, the settings used, and samples, pricing starts a under US$0.02. We are happy to quote you on a PeakTrace:Box System that suits your exact needs. The PeakTrace:Mini systems (under 100 000 units per year) have an additional once only hardware set-up fee of US$500. For leases of less than six months we may require a deposit of US$250 per USB key, which is refunded if you choose to stop using PeakTrace and return the key. As a general rule PeakTrace RP is cheaper than the PeakTrace:Box system if you are processing less than 150,000 traces per year. I am not sure if PeakTrace will work in my facility? PeakTrace comes with a 60 day, full money back guarantee. If you find that the PeakTrace Basecaller does not meet your expectations for any reason you can cancel it within 60 days for a full refund – all we ask is that you tell us why you chose to cancel. This means you can trial PeakTrace in production without risk that it might not work with your workflows. We should add that so far out of the hundred of users and customers of PeakTrace nobody has ever taken us up on this guarantee. Which version of PeakTrace should I use? This is a difficult question to answer, as it depends on your particular needs and circumstances. If you are generating more than 150,000 trace per year, then the PeakTrace:Box system is most likely suited for your needs. If you are generating more than 1,000, but under 150,000 traces per year Auto PeakTrace RP is most likely to be a better fit. Under 1,000 traces per year and the PeakTrace for Chromas is likely to be the best fit. Am I charged for traces not improved by PeakTrace? No. Except in a couple of unusual circumstances, if your sequence traces are not improved by the PeakTrace Basecaller, then you are not charged for the processing. This means you can use PeakTrace with confidence and not worry about paying for failed reactions – wouldn’t it be nice if everything to do with Sanger sequencing came with the same guarantee! Can I try PeakTrace for free? Yes. PeakTrace is built into the free Chromas trace viewing software. Once registered you will receive 40 free PeakTrace units to trial on your own samples. If you are running a sequencing facility and wish to process more sample, then PeakTrace Pro provides access to the full PeakTrace software for one week. Only register for access to PeakTrace Pro if you have a large number of samples to process and are ready to start processing them – for small users Chromas is best as you get access for longer than a few days. How do I purchase PeakTrace? If I purchase PeakTrace will you keep my traces? The bottom line is we don’t examine the data of our paying customers without their permission. PeakTrace is the result of more than 19 years of R&D at Nucleics focused on improving DNA sequencing. While developing products like the CounterTrace DNA sequencing system, CounterTrace II DNA sequencing system and LongTrace we learnt a great deal about how to best process and basecall the raw data of DNA sequencing traces. The algorithms and approaches that we developed for these past products is the foundation on how the PeakTrace Basecalling software is able to extract more usable and accurate bases from each trace. For more information about what PeakTrace can do and how it can be used, please visit the PeakTrace Basecaller Overview page. We have released a whitepaper on PeakTrace describing the validation of both the PeakTrace and KB Basecallers. Please download the PeakTrace Whitepaper to learn more, or visit the PeakTrace FAQ page. If you are interested in the basecaller validation process, we have written about the validation process we performed for PeakTrace and KB.